If there are two things we love around here it’s bright colors and a partially bare mani. Negative space manicures like this one are so fun and give you a chance to play around with multiple colors instead of committing to just one. 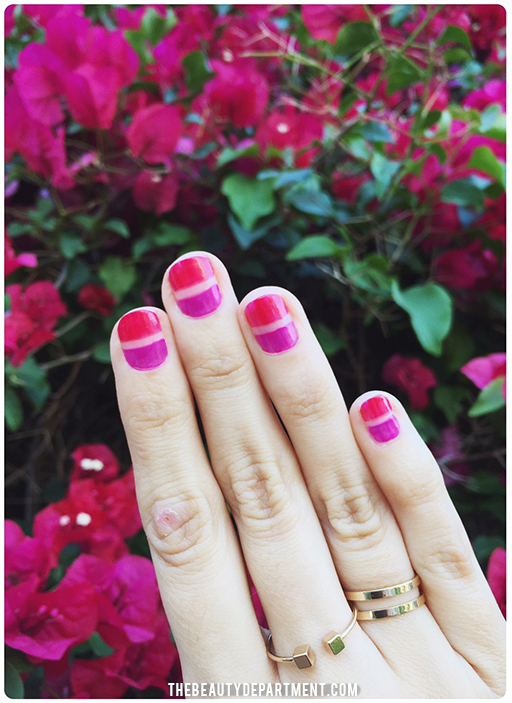 For this particular pairing, we used the two shades of bougainvillea we usually see. One is an orange-y hot pink and the other one is more of a purple/pink/fuchsia situation. For the hot pink shade we chose DOUBLE BREASTED JACKET and for the more purple shade we worked with BETWEEN THE SHEETS. Grab a roll of WASHI TAPE and cut small strips to go across your nails horizontally. Make sure you really press them down well so polish doesn’t seep underneath them, messing up your line. Use your first color (we went with hot pink near the tips and purple at the base) and paint the portion closest to the tip of the nail. 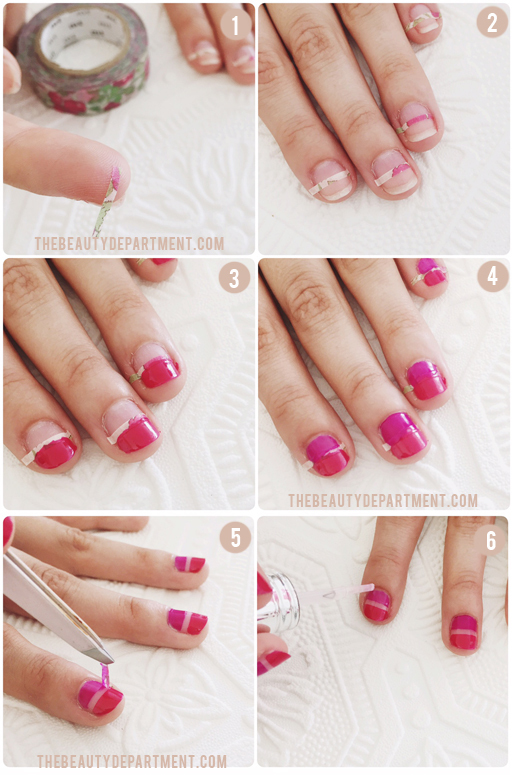 Next use your purple to paint the section closest to your cuticle. We only used one coat of each color and it seemed to be enough but you may need two. NOTE: work quickly as you don’t want the polish to harden to the tape and make it hard to pull up. Use tweezers to gently pull back the strips of washi tape. Add a good CLEAR TOP COAT. <—– THIS ONE IS MY CURRENT FAVE.